The researchers supply an image of an area in a drop of Sanofi Pasteur MSD’s Repevax (diphtheria, pertussis, tetanus, polio) vaccine “where the morphology of red cells - we cannot tell whether they are human or animal- is clearly visible” along with the presence of “debris” composed of aluminum, bromine, silicon, potassium and titanium. The investigation revealed aluminum and sodium chloride, the usual component of saline, as was expected, because they are named ingredients of most vaccines. Using a Field Emission Gun Environmental Electron Scanning Microscope, the researchers produced photos of this aluminum salt which formed white crystalline branches similar to frost on a windowpane on the top of the droplets of vaccine liquid. A German-made vaccine against allergies produced a layer of inorganic salts so thick that the researchers could not penetrate the drop to detect other particulate contaminants. Once inside a body, foreign material in a vaccine shot, whether it is meant to be there as in the case of an aluminum, or not, in the case of contaminants, launches the formidable immune system into action. As with anything small and foreign, its reaction to vaccine ingredients is potent, poorly understood, unpredictable, and as the Italian researchers say, may be “undesirable.” The immune system may dispatch an army of large white blood cells called macrophages to engulf the foreign bodies and contain them in swellings and granulomas at the injection site. But if the contaminants are swept away in the blood’s circulation to any distant site or organ including the microbiota, which regulate numerous functions including the immune system, their effect could be felt long after they covertly entered the body. In some cases, the immune system my initiate an inflammatory assault against what it perceives as invader. This may include the launch of a host of players called cytokines. Some of these chemical messengers like interleukin-6 are incriminated in autism. Because these contaminants may persist in the body and stimulate the immune system, they may induce chronic inflammation and can manifest as autoimmune diseases when the immune system turns on its host's own cells as in multiple sclerosis or type 1 diabetes. It’s also been shown that the contaminants found in the vaccines can enter cell nuclei and interact with DNA, the researchers note. No one knows what that can do. Vaccines have a long and sordid history of contamination. In 1955 batches of polio vaccine containing live polio virus infected and paralysed hundreds of children. The tragedy became known as the Cutter Incident for the laboratory where the vaccines had passed safety tests with flying colors. The polio vaccine doled out between 1955 and 1963 was contaminated with simian virus 40 (SV40) from monkey kidney cells used to produce the vaccine. It’s been linked to the growing epidemic of cancer. In 2007, Merck & Company, Inc. recalled 1.2 million doses of Hib vaccines due to contamination with bacteria called cereus, a potentially lethal food-poisoning bug. In 2009, more than 40,000 doses of a meningitis C vaccine for babies were withdrawnfrom the British market when they were found to be contaminated with blood-poisoning bacteria, S aureus. In 2010, deep sequence analysis of eight different live attenuated virus vaccines revealed unexpected viral sequences in three of them: retrovirus avian leukosis was found in a measles vaccine, a virus similar to simian retrovirus was identified in Rotateq anti-diarrhea vaccine developed by CDC consultant Paul Offit, and the entire genome sequence of porcine cirovirus1 was found in Rotarix leading the FDA to suspend the rotavirus vaccine. In 2014, The US Food and Drug Administration ordered GlaxoSmithKline to review the manufacturing operation of its flu vaccine when it found microbiological contamination of products purporting to be sterile. In 2013, Merck & Company, Inc. recalled one batch of Gardasil when glass particles were discovered in several phials. Recently it was reported that Sanofi Pasteur refused to recall its ActHIB vaccine for babies, even though it knew it was contaminated with glass shards. The FDA didn’t object. There are dozens of these cases, and even if vaccine manufacturers are issued multiple “warnings” action is rarely ever taken to clean the vaccine manufacture process. Since pharmaceutical companies have blanket indemnity from lawsuits for faulty vaccines, there is no incentive for them to clean up their act. 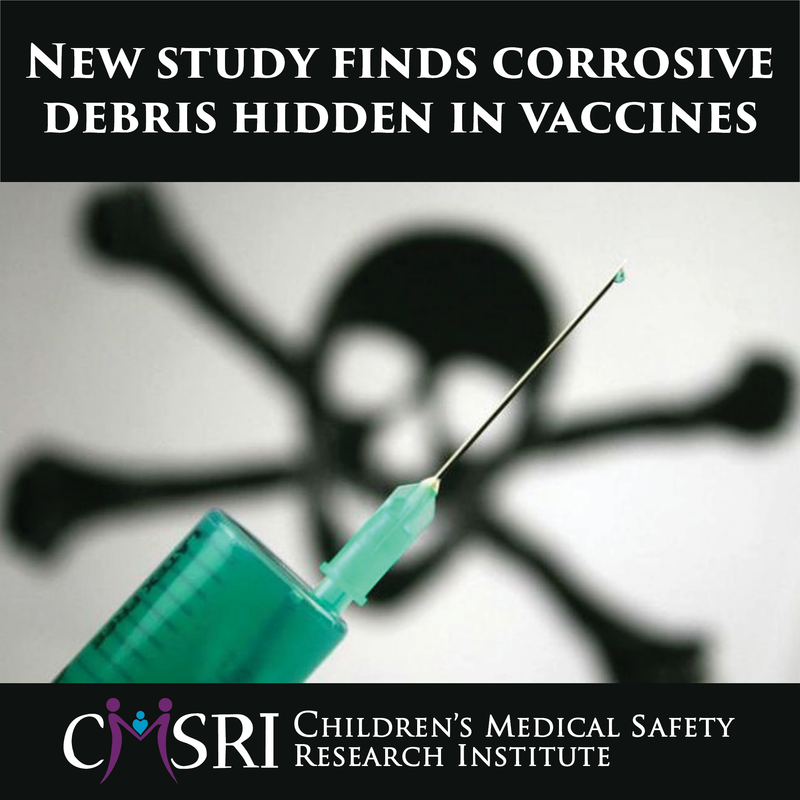 The study investigators conclude that the vaccine contamination they found is likely accidental. “Our hypothesis is that this contamination is unintentional, since it is probably due to polluted components or procedures of industrial processes (e.g. filtrations) used to produce vaccines, not investigated and not detected by the Producers”. Discussion about why pharmaceutical companies don’t produce clean vaccines is one thing. But the reality of vaccines as they are now is another. It doesn’t change what is being injected into millions of people today. Dangerous unintended toxins are in every one of the vaccines tested in this investigation, except one for cats. This research doesn’t just show that vaccines are full of crud that top scientists can’t even define. It makes a mockery of health oversight agencies like the FDA and CDC and their lies that vaccines undergo adequate safety checks and risk assessment. It doesn’t merely reveal that the long-term consequences of vaccinating cannot even be assessed. If anti-cancer vaccines like Gardasil and Cervarix contain cancer-causing aggregates of toxic metals, their use as a weapon against a cancer a girl has zero chance of getting before age 21 is not just useless. It is egregious abuse. Now, every vaccine’s claims to saving lives must be weighed against its risks of causing cancer, neurodevelopmental disease, autoimmune disease and every other immune-mediated “mystery” disorder now epidemic and soaring. The results of these investigations not only negate every assertion that vaccines are “safe and effective”, but they confirm that they are actually a clear and present danger. The Children’s Medical Safety Research Institute (CMSRI) is a medical and scientific collaborative established to provide research funding for independent studies on causal factors underlying the chronic disease and disability epidemic. Feline Bartonellosis and Cat Scratch Disease.